Button-Down: Club Monaco. Sweater: Zara. Necklace: J.Crew. Pants: F21 (similar: here). Heels: Christian Louboutin. Purse: LV. Watch: Michael Kors. Fall weather has made it's appearance here in Chicago, so exposed limbs may in limited quantities until next year. Coupled with a lingering cold layers were on my agenda this past weekend. But at least that meant getting to wear some of the new items in my closet! Red jeans & chunky knit sweaters! Gorgeous outfit! 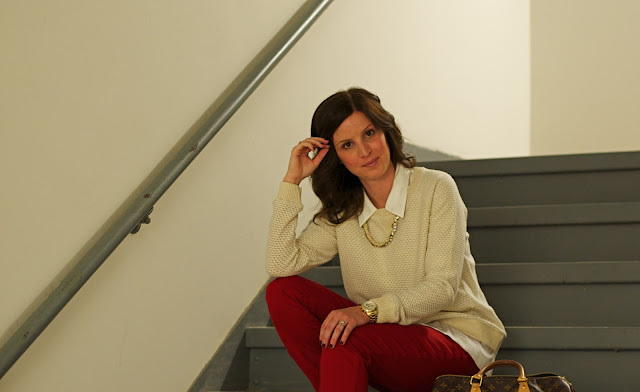 I just bought a pair of red pants this weekend and I can't wait to wear them - maybe today! I adore this outfit. Simple, classic with a punch of color. The chunky knit sweater is going to be new obsession for the fall. This is a beautiful outfit! It's so perfectly tailored! How lovely. And I just adore your Louboutins. :) Have a great Monday. LOVE this outfit, and your new look! The blog looks amazing! omg, you look amazing, lady! such a perfect fall outfit. You look adorable, love this outfit! This outfit is absolutely perfecttt for fall! I need to head out and pick up more chunky knits like this - can never have too many, right? This outfit is perfect. 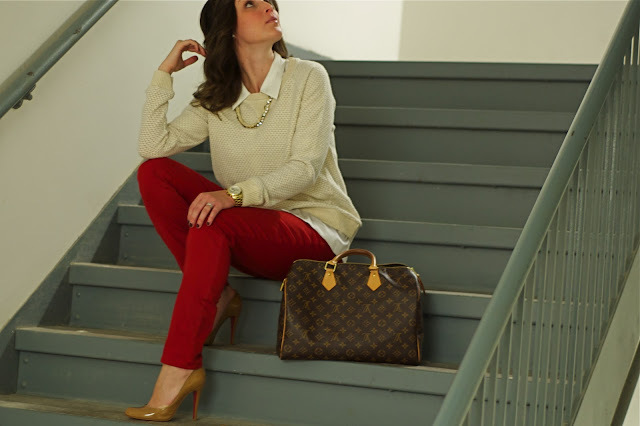 The red pants are awesome, perfect for fall! So pretty! I love, LOVE your red pants, and that chunky sweater is perfect. And of course those heels are killer. I love red pants! I love mine and I got them from Forever 21 too! Oh, I love how cozy that sweater looks!! I especially love that you have a collared shirt underneath and those red pants. This outfit is SO spectacular..you have inspired me to purchase red pants...I NEED a pair...they look so damn fabulous here on you. Perfect fall outfit, I can't believe those pants are from forever 21, they look so nice and they fit you perfectly! Good luck kicking your cold! 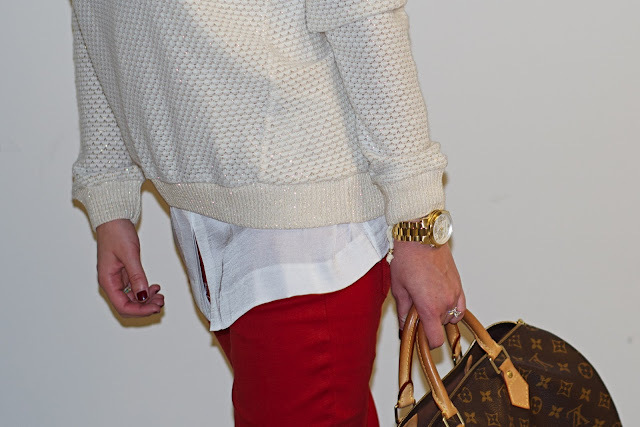 the red pants are gorgeous, and the texture on the cream sweater is really pretty! What an incredibly classy look! LOVE the red stems! Love your hair here, too. Love the red pants! Great look. I've been looking for some red pants just like this, and whilst I don't have these fabulous heels to wear with them, I'm very tempted to head to F21 right this morning..